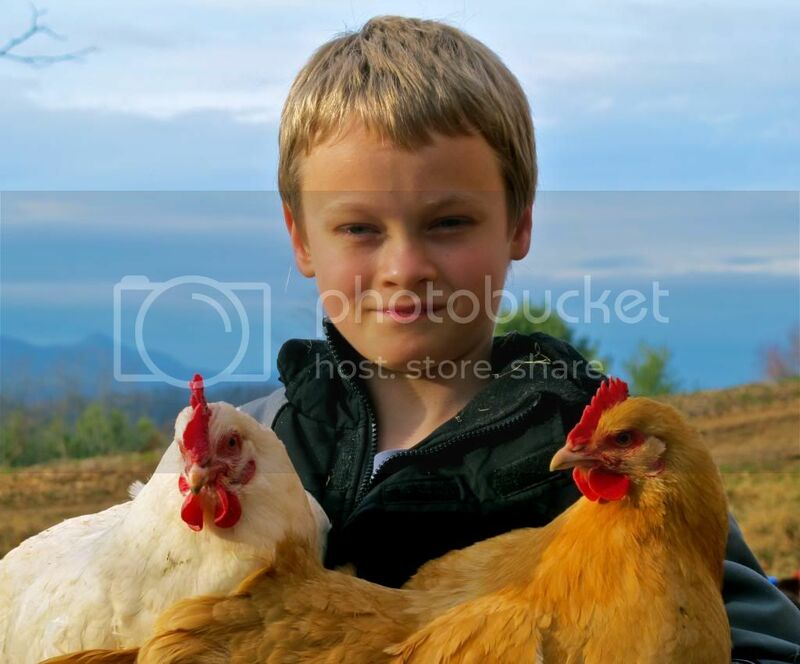 Here on our homestead we raise both chickens and ducks. Almost everyone is familiar with chicken eggs, but what about duck eggs? What’s the difference between duck and chicken eggs? And how do duck eggs they compare to the incredible, edible, chicken egg? I’ll start with the most noticeable- size. Our Khaki Campbell laid the large white duck egg on the left, while the brown egg is from one of our standard sized chickens. Even our newer layers- the Swedish Blue and Black- lay large to jumbo sized eggs right from the very start. The size difference is just as apparent from the inside- the yolk is much larger in the duck egg than in the chicken egg. The shells of a duck egg are much tougher, and it can be harder to get a clean crack, but it also leads to a longer shelf life. 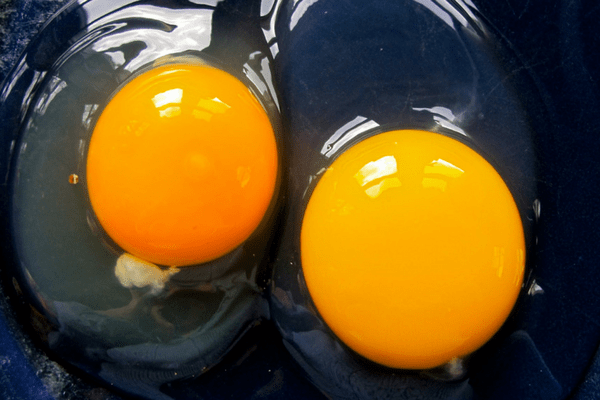 When it comes to nutrition duck eggs and chicken eggs are pretty similar in their contents. But in most cases duck eggs come out on top. Another thing to note, is that many people who are allergic to chicken eggs can tolerate duck eggs. But be sure to talk to your doctor before giving that a try. Duck and chicken eggs vary somewhat when it comes to cooking. I love using duck eggs in my breads and cakes. Hard boiled? Not so much. They get a little rubbery. Duck eggs have a richer flavor, which can be a positive or negative depending on your tastes. This difference in taste is most likely due to the higher fat content. When we cook eggs plain we usually use a mix of duck and chicken eggs. But when I do cook them separately I can’t tell too much of a difference when I have a plate full of scrambled duck eggs or a plate full of chicken eggs. You might have a more sensitive palate than I do though. Duck eggs contain more albumen, which gives them more structure, thus creating a very light, fluffy, and rich baked good with a higher lift than those made with chicken eggs. 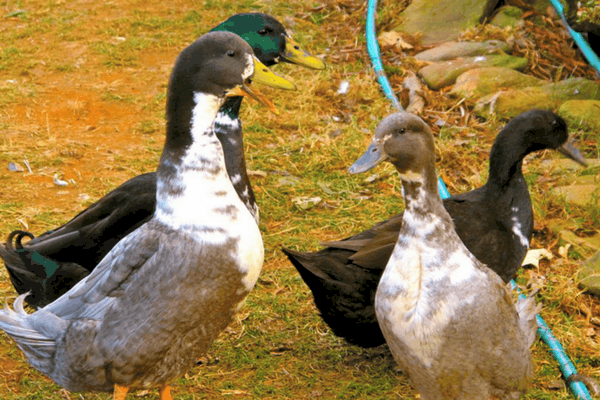 When it comes to raising ducks there are a few more differences. They are a bit messier- especially around water. Most backyard breeds don’t need access to a pond, but would be very grateful to have access to something to submerse themselves in- such as a wading pool, barrel or washtub. They do need to be able to get their head completely wet every now and then and they need water to swallow their food, so make sure there is always water available. Ducks are easier on the garden too. They shovel and rake with their bills as opposed to scratching and pecking. So they take less toll on the yard and tend to leave the garden produce alone and go straight for the weeds and bugs. When it comes to laying the comparisons will differ based on breed. Some lay year round, some are more seasonal. Most chickens lay an egg a day or every other day for about 2 years before they taper off and lay more intermittently. Somewhere around age 2 is when our chickens are replaced with new hens and the old ones become dinner- for someone. But if you want an amazing layer the Khaki Campbell duck can’t be beat. Their eggs are huge, they lay pretty close to every single day year round, and ours, who is close to 3 years old now is still going strong. So there you have it. 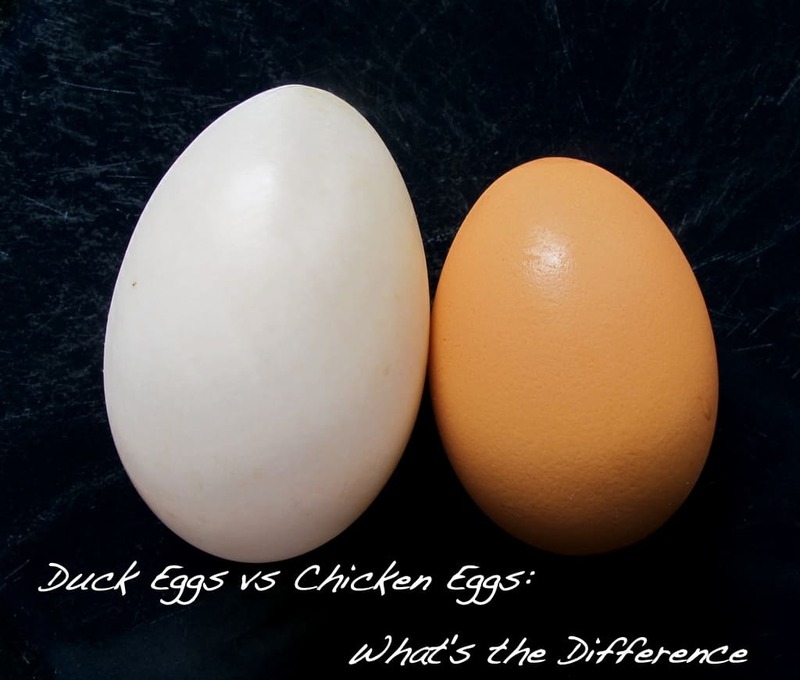 The main differences between duck and chicken eggs. Have you tried duck eggs or raise ducks? How do you think they compare? 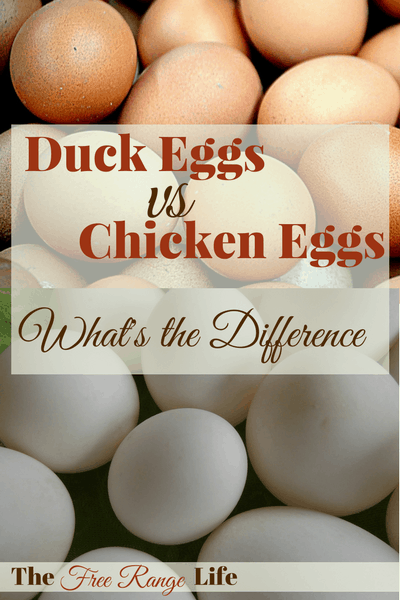 Do you want an quick reference for the difference between duck and chicken eggs? Check out my Infographic: Chicken Eggs vs Duck Eggs! © 2013 – 2018, Sarah R Toney. All rights reserved. We love ducks! Our boys love eating their eggs. We had to settle for only having pekins because our khaki campbells and other breeds were flying to our neighbors pool. 🙁 Our duck eggs yolks are a lot darker on the outside then the chickens’. However, when you pop the yolk it’s the same inside. I assumed they were all like that but I guess I need to research that after seeing your pic. Omg their swimming pool?!! Thats hysterical. But yes that would be a problem. Thanks for the info. We’ve only raised chickens but are considering ducks. You make a good case for it! Do chickens and ducks need to be in separate enclosures? No. I have regular chickens, banty chickens, ducks, geese, guinea, and 2 turkeys that all run together. Sometimes the geese get too aggressive against the other birds, at which time we have roast geese! I keep chickens (Australorps) and ducks (pekins, Indian runners and muscovies) together, and they get along fine. Ducks make a lot more mess than chickens, though, and will soil up the water containers, so you have to spend a bit more time cleaning up and refilling bowls. We love the duck eggs in cakes and pavlovas, as well as just eating them fried or poached. Wonderful post! I only have chickens at the moment, but with spring nearing I have had a though about ducks once or twice! I just may have to slip a few in on a hatchery order after all! Adore my ducks !! Love Duck eggs for eating & baking !! Harry my Drake , follows me around the yard everywhere !! Highly recomend Indian Runners !! Sherren / Whidbey Island , WA. This was very informative! THanks! I will have to mention it to my husband so that when we do get our little farm, we can look into getting some ducks. Quick question for anyone who knows…….how long can you leave unpasturized duck eggs out without refrigeration and still be safe to eat? Please answer ASAP. Thanks. I am not positive, but I would assume they are similar to all other fresh eggs and will keep a few months. We leave all ours out on the counter. You can always try to float test them to see, too. the issue is if there was a male to fertile the egg then it will attempt to grow a baby. 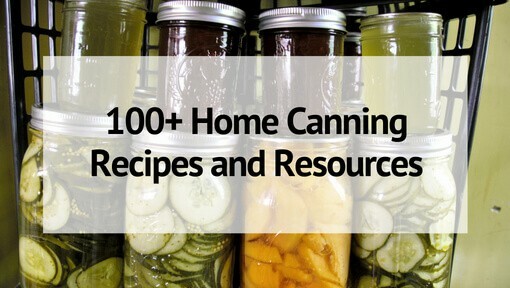 unless kept refrigerated. even chicken eggs must be picked quickly after being layed if a rooster is there. most actual egg farmers who only want chickens for the eggs they dont keep a rooster they only keep hens that way the eggs are not fertile. hens will lay eggs wether there is a rooster in the picture or not… so the general idea is to not have roosters if ur just wanting eggs to eat. other wise u gotta watch out what ur doing or u might get a egg with a suprise inside one day lol. Embryos will not form unless the eggs are sat on or in an incubator. Refrigeration isn’t needed to prevent this as long as the eggs are taken daily. I use them in the same ratio. Duck eggs are usually more jumbo sized, so if it is a more sensitive recipe that calls for say 3 large eggs, I might just use 2 of the jumbo duck eggs. If they are about the same size though I would use them equally. no two duck to three chicken eggs. standard recipe weight for 1 large chicken egg is two ounces. Measure that way for duck eggs and your recipe will be correct. I loved this article! We just discovered duck eggs last week when we went to the farmers market! I swear I’ll never eat another chicken egg. Duck eggs are simply delicious!! After using duck eggs for so long, it’s funny trying to use a chicken egg. Every time I crack the chicken egg way too hard – because I’m used to the tough duck egg shells! We have had both ducks and chickens. We had the ducks trained to follow us around when we carried the white bucket (meant irrigation time) and the chickens would follow you around everywhere if you were carrying a shovel (digging up dirt always meant lots of yummy bugs!) But I always preferred the taste of the duck eggs. To me they tasted like they had a lot less sulfur flavor. They didn’t make very good scrambled eggs because they didn’t seem to mix well, but they tasted good anyway! hi, if some one would like to have three eggs of chicken than it is better to have two eggs of a duck as When it comes to nutrition duck eggs and chicken eggs are pretty similar in their contents. Very useful information! I do pysanky (Ukrainian Easter eggs) and would like to try duck eggs some day. 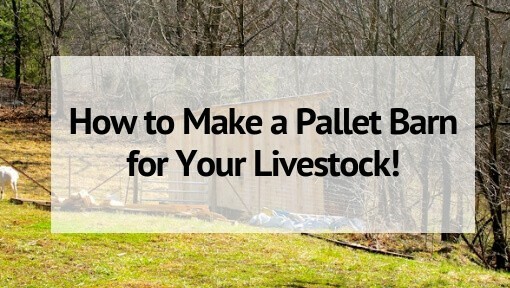 Larger AND with a tougher shell than grocery store chicken eggs makes them sound ideal! More room for decoration and much less likely to break when being emptied. 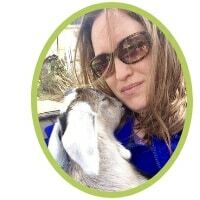 My friend is a peta person and will not eat eggs from the grocery store because of the abuse . It is awful, so I told her my spn raised a couple ducks and they were well taken care of.,so I suggested she try them. She was OK with trying them. I wanted to found out the difference between chicken and duck eggs. Thanks. All I read was very impressive . A lot of good informatiom. Its so nice to know about eggs. Being a vegetarian I eat chicken eggs sometimes, like omelette. Have not tried duck eggs as I am told that one farts a lot with duck eggs!! Hahaha I am not sure. But please guide me the best way of eating egg; whether duck egg will smell too much when you make an omelette; how many eggs should I eat a day and when I should eat and when I should not!! I also saw some small colourful eggs in the store- (quill??). I was not good at poaching my chicken eggs and gave up and resorted to frying them as gently as I could. I recently bought 6 duck eggs at my local farmers market. The difference made it possible for me to poach the duck egg (just one). Thank you for this info. I finally got around to looking for duck egg info today. I will be buying more duck eggs now because I think poaching is the way to best preserve the nutrients and it was great over lightly steamed veggies w grated cheese salt and pepper. yay! I’m trying to eat fresh nutrient dense local foods as the main part of my diet. 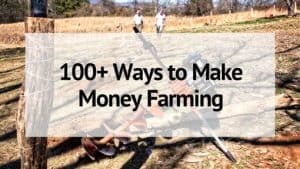 I’m not able to produce my own for various reasons but do go to area farms and the farmers market and try to make wise choices for my budget and my health, and to support the best farms in my area. My daughter has been raising ducks for several years now and we hve found that a duck egg just needs a little bit more of tender cooking time for example scrambled eggs should be mixed with a tiny bit of milk or water about a teaspoon per egg. Then cooked until curds are formed cover and cook on very low stirring occasionally until your desired doneness. Remember low and slow. Same for a boiled egg. Bring duck eggs to a boil slowly then when brought to a hard boil take off heat cover and leave in water about 12 yes 12 minutes. After run under cold water. Frying and poaching are similar to regular methods. I love them in my baking. We have four ducks laying, and they are free range other than I put them up at night. I’m getting four eggs a day, but I’m so disappointed because something in the duck eggs seems to upset my stomach. With chicken eggs I don’t have any problems. I just wondered if you ever heard of this? Having free range eggs was a dream come true, but now I can’t eat them! Just dropped in to learn about Duck eggs! Thank You for this interesting information. Very informational. My son is allergic to chicken eggs and cow milk. Therefore, I’m looking to lead by example and make changes for everyone in the family. Thank you. 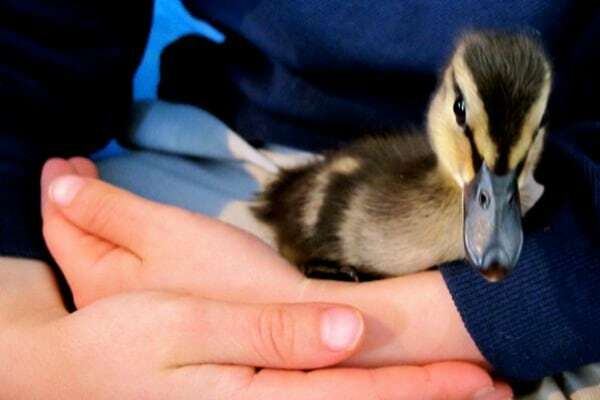 Yes, the eggs of young ducks tend to be smaller in size than older ducks…so closer to the size of a chicken egg. Has anyone ever tried domesticating mallards? Are they domesticatable? Do they produce eggs year-round? I’ve eaten the bird but never their eggs (they seem to lay several each Spring inside our covered boat). HAVE YOU EVER HEARD OF A DUCK THAT LAYS IT’S EGGS IN WATER? MY COUSIN BOUGHT SOME DUCKS FROM A FAMILY FRIEND AND THIS IS WHAT THEY ARE TELLING HIM. I think what they meant was they have a nest over the water, like Florida cypress trees just grow right in the water. I’ve known people who build nest boxes about 4-6 feet above the pond. The ducks love it. Also, if you live near a pond and want to encourage local mallards to nest near your pond, you can take chicken wire and lots hay, layer it out and roll it up like a hollow burrito. Mount this 2 feet long x approx. 1 foot diameter “roll” in a 4×4 post that’s been hammered into the pond bottom, making sure the inside has plenty of hay. You get the idea. Look on you tube for really good directions. They love nesting these open ended hay tubes. I’m preparing to get my first chickens, but after reading this I think I also want a duck! I know I would never be able to eat my own chickens, I know, I’m funny, but what do people do with chickens after they stop laying, besides eating them? We sell them on Craigslist. Some people buy them for pets some to eat….we don’t ask and don’t want to know. Hi! This may be a silly question, but I’m a complete newbie to this. Are ducks like chickens where they lay even if there is no male around? Or do you need a drake to get the ducks to lay eggs? We had ducks for ages and loved to eat the eggs. We finally had to send them all to “freezer camp” which is where the livestock on our farm goes when its useful life is done. Problem was no matter what we tried, we could not keep them out of our goats’ water. They had their own little swimming pools and other water but they insisted that the goat water was best for cleaning their bills in. This led to filthy dirty water just minutes after cleaning it out. We have had parasite problems like you would not believe so had to say goodbye to ducks and their antics.